A medical student named Gabby (Teresa Palmer) has just moved in next door to a man named Travis (Benjamin Walker), who has a reputation for having a way with women. At first, Gabby finds Travis insufferable, but after her boyfriend goes on a business trip, she gets to know him better as they quickly fall for each other. However, they will soon have to face choices and tragedies that may change the course of their lives forever. Being a cinematic adaptation of a Nicholas Sparks novel, "The Choice" is a formulaic romantic drama with all of the standard tropes we have come to expect from this kind of story. To say it is painfully predictable would be the understatement of the century. Without reading anything, not one morsel of information about this film, we were able to predict each major plot point, even the ending, on the drive from our house to the movie theater. Either we're that good at predicting the future, or the rom-dram genre has gone to hell in a unoriginal hand basket. The plot is both generic and overly melodramatic from the moment the first words are even uttered. Of course, when the two protagonists meet formally for the first time, Travis, played by Benjamin Walker, and Gabby, played by Teresa Palmer, don't like each other. It's during this meeting where Gabby proceeds to verbally berate Travis in an overly nagging, argumentative manner, because you know, all women are apparently completely irrational hags all the time! Though Travis has an on-again-off-again relationship with his high school girlfriend Monica, played by Alexandra Daddario, it's mostly off again. Gabby, however, is in a committed relationship with a doctor at her work named Ryan, played by Tom Welling, and the two seem to get along extremely well. Before Ryan even has a chance to leave the driveway on his way on a work trip, Gabby and Travis are on top of the kitchen table getting to know each other in the biblical sense. We seriously don't know how many more of these movies we can take. 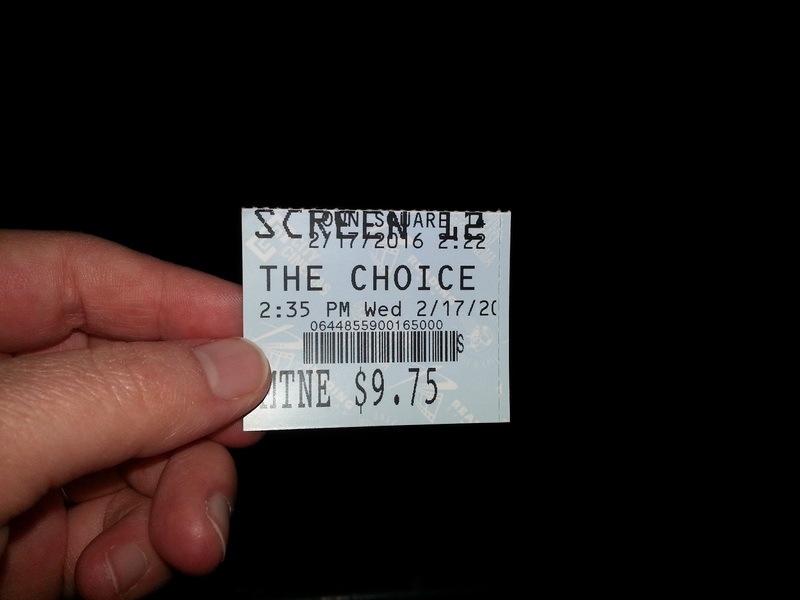 Beyond the sketchy story, almost everything else about "The Choice" is awful. The pacing is atrocious. Most of the film is reserved for the beginning and end portions as the middle is simply glossed over quickly. So much of it drags and drags as the minutes tick slowly by, and we even checked the time in a few instances, something we rarely if ever do. The dialogue sounds like it was written by a sixth grader, which is really an insult to kids because we know some children are capable of much more than what "The Choice" has to offer. The phraseology is always super cheesy, and the situations mirror this pathetic dialogue and are as unrealistic as ever. It would all be far less tolerable if it weren't for Benjamin Walker, who is a fairly charming, likable guy, and we hope to see more of him in the future. Tom Wilkinson also plays a supporting role here, continuing to add questionable career choices to his resume, but hey, it's a paycheck, right? His performance is good enough, so we really can't complain. We're starting to wonder how much steam Hollywood has left for these Nicholas Sparks book adaptations. Ever since the second iteration of these films have they been formulaic with similar stories and only minor tweaks, and not in ways that set each film apart from one another. There have been 11 film adaptations of the 19 books Sparks has written, and personally, each one has grown more tiresome than the last. They wore out their welcome years ago, and not one has managed to hold a fresh rating on Rotten Tomatoes (which is not the be all end all of reviews, mind you, but it can be a good gauge). Even his magnum opus, "The Notebook," which is a movie we genuinely enjoy, sits at a mediocre 52%. Fans of Sparks' books might still have a certain level of acceptance for these films, but for the rest of us, "The Choice" is just another adaptation in a long line of unrealistic, emotionally manipulative romantic dramas that are completely and nauseatingly forgettable. One year ago, we were watching: "Kingsman: The Secret Service"